If you’re talking building science, there’s a solid chance beer is involved. Builders (we hear) like beer. So when beer brewing and building construction can both be done at a high level, it’s something close to heaven. 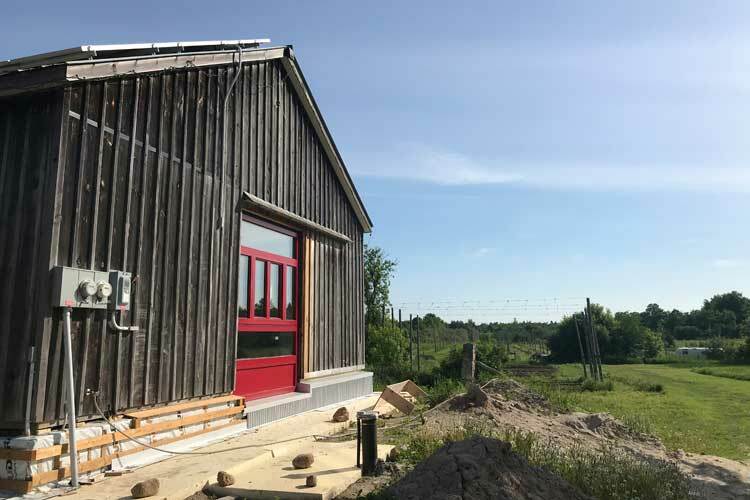 This project located northwest of Toronto married the two when The Fourth Pig Green & Natural Construction renovated Goodlot Farmstead Brewing's old barn into a high-performance brewery. 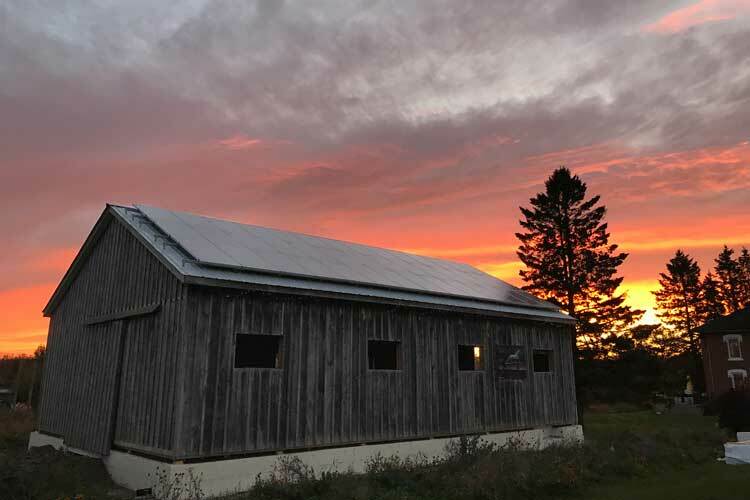 GoodLot Farmstead uses hops grown on their farm in combination with locally grown grains and other ingredients to create truly local Caledon ales and lagers. 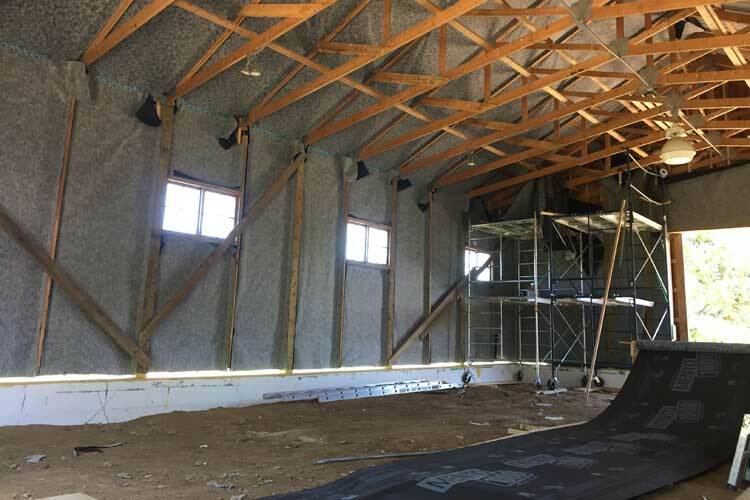 The brewery began with off-site contract brewing while doing a full renovation of a barn to a brewery by the Fourth Pig. The Fourth Pig started with the existing horse barn on the property. 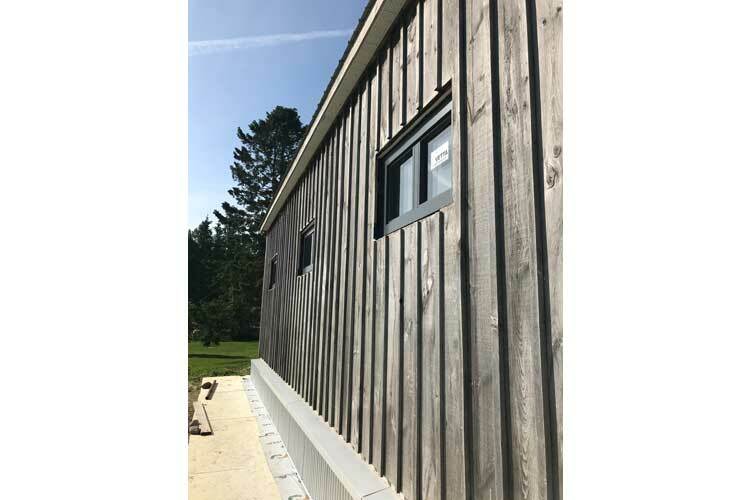 It consisted of a pole barn structure with trussed roof, sheathing-less walls and roof, board and batten cladding, and a galvanized steel roof. By salvaging this existing structure, the upfront embodied carbon of the project was significantly decreased. 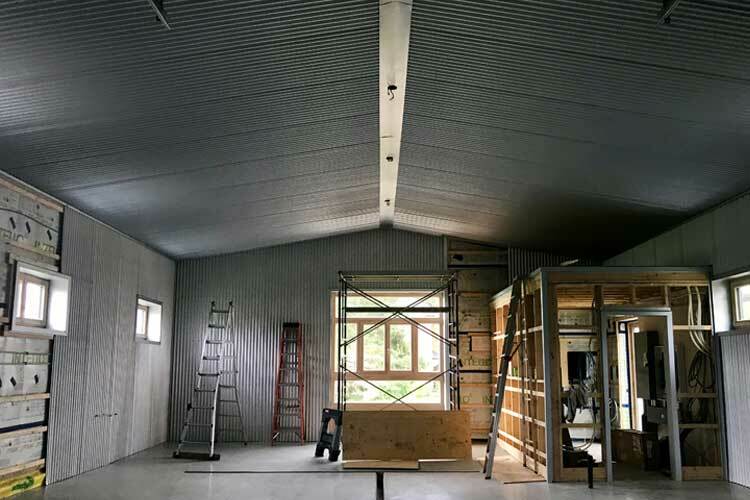 During this renovation, the Fourth Pig team took a holistic approach to sustainability, addressing energy and carbon savings in both the structure (embodied carbon) by making conscious material choices, and the operation (ongoing emissions) by making the building envelope durable, highly insulated, and airtight. They used an integrated design philosophy to turn this simple structure into a high performance building. 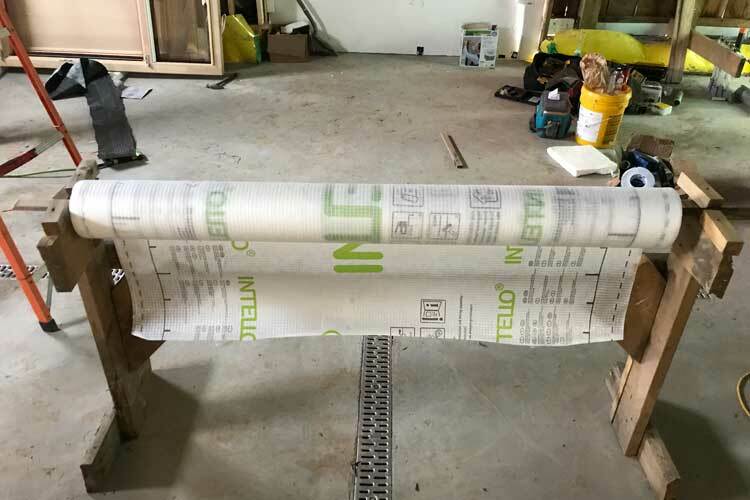 First SOLITEX MENTO 1000 exterior membrane covers the planks. Notice the handy homemade membrane roller built to make application easy. 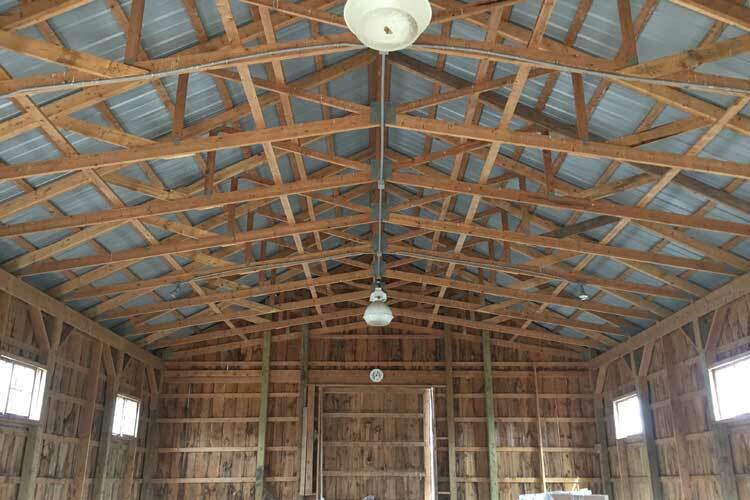 The existing board and batten siding was saved in place as was the horse barn pole wood framing. 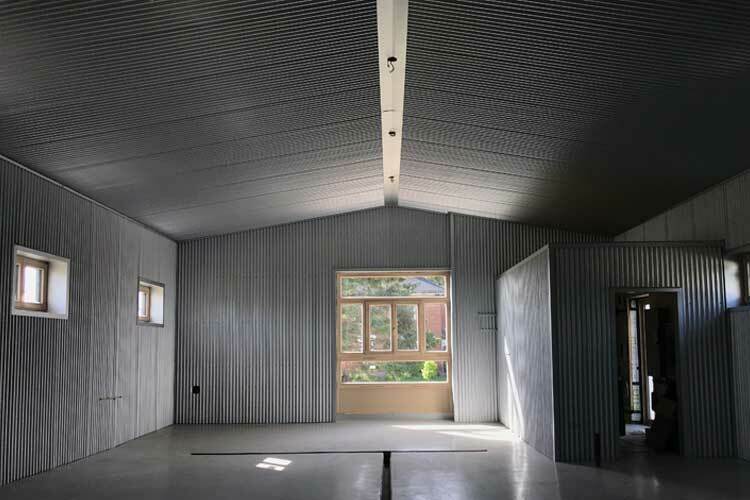 The new interior finish and exterior foundation skirt are reused metal sheets. 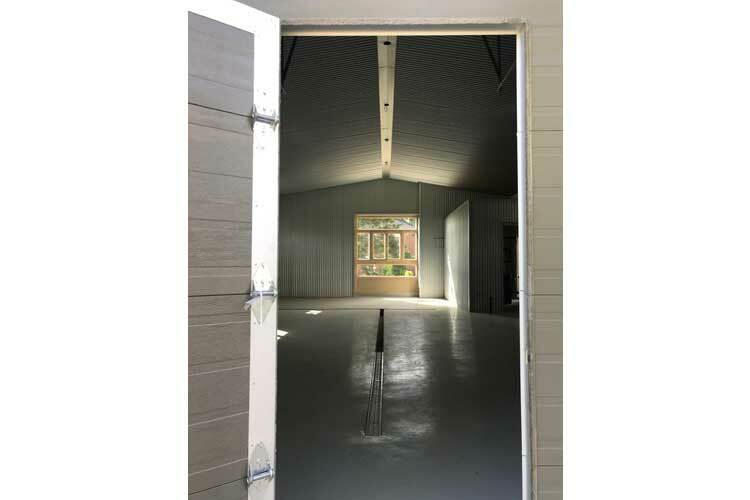 The slab employed low-carbon concrete with 50% slag and lime instead of cement with recycled aggregate, resulting in a 60% carbon reduction over typical concrete. The foundation also used rebar with recycled content. 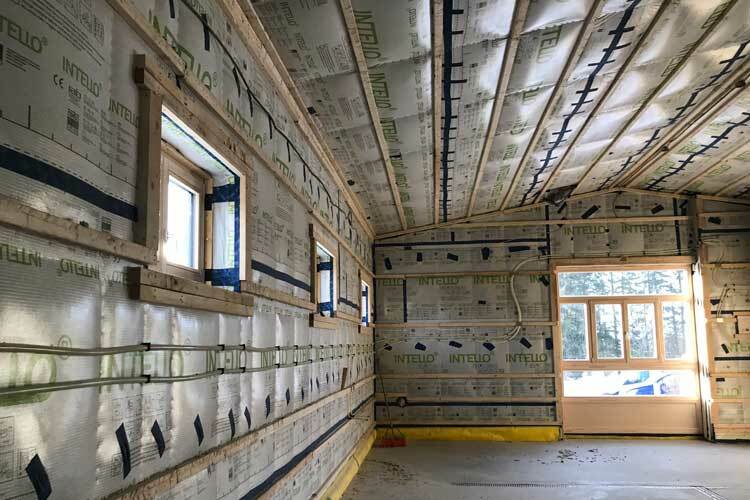 The insulation is dense-pack cellulose. FSC certified wood utilized throughout supports biodiversity. Existing, unnecessary framing was removed and rainscreen 2x battens were left to hold the new WRB and dense-pack insulation in place, building outside-in. Instead of installing the typical sheathing, metal diagonal strapping was used to support the sheathing-less assembly. A 3” deep, back-vented rainscreen was a gift of the original construction. 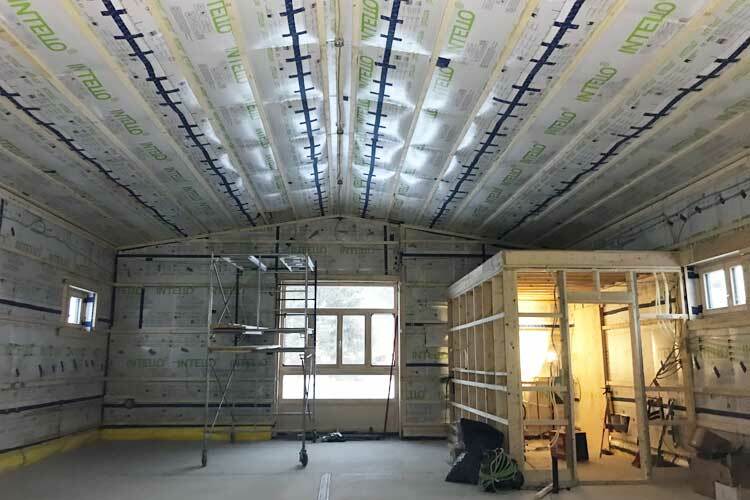 Waterproof, vapour open, airtight, monolithic SOLITEX MENTO PLUS membrane was then applied to the rainscreen framing from the inside and terminated at the framing with CONTEGA HF adhesive and staples. 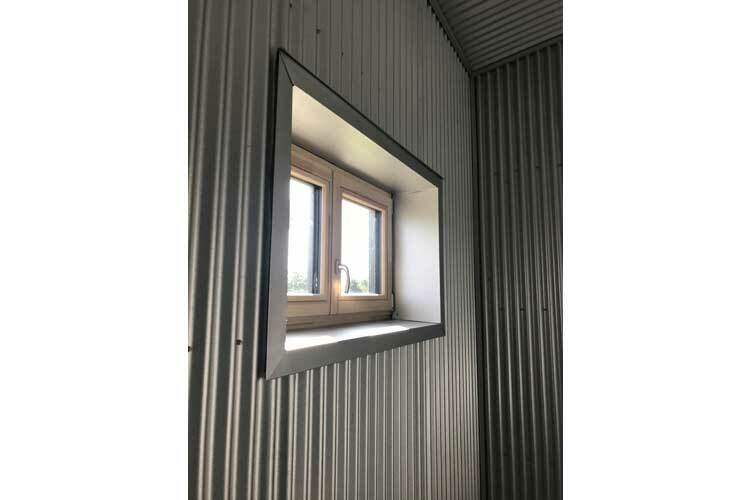 A new interior double-stud wall with diagonal bracing forms a 10” deep cavity for continuous insulation. 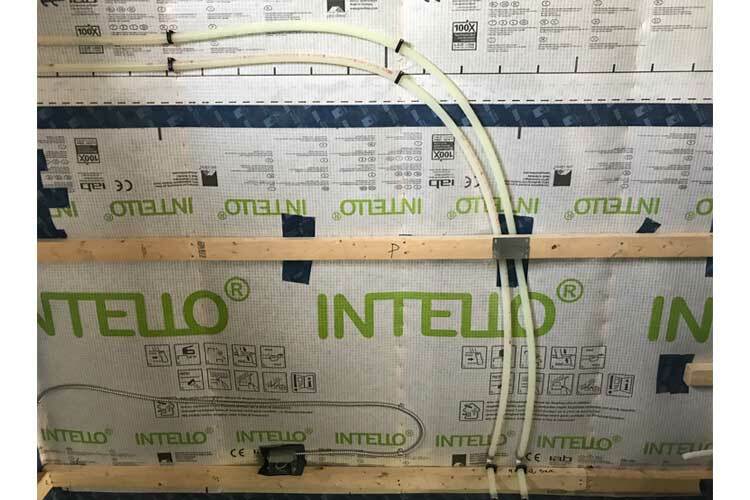 Inboard of the stud wall is INTELLO PLUS smart vapour retarder and inboard air barrier with TESCON VANA tape sealing the seams. 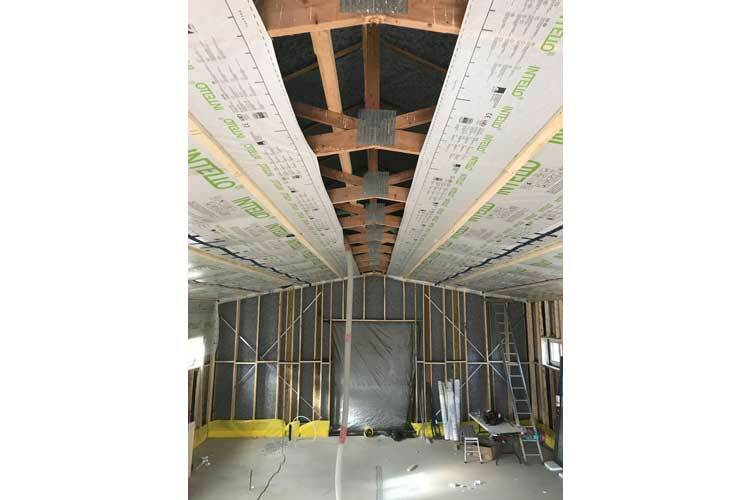 Then horizontal wood strapping forms a service cavity, minimizing penetrations and protecting the airtight layer for renovations in the future. The finish is reused sheet metal. 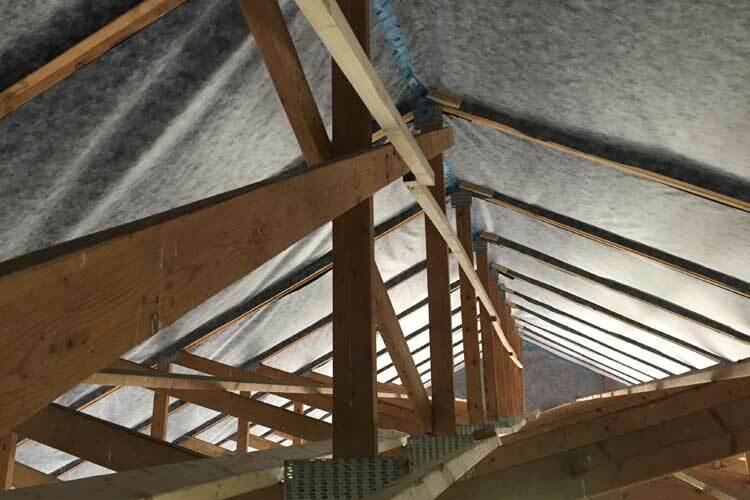 The roof has a similar build-up, except that the roof truss forms the deep cavity for insulation. 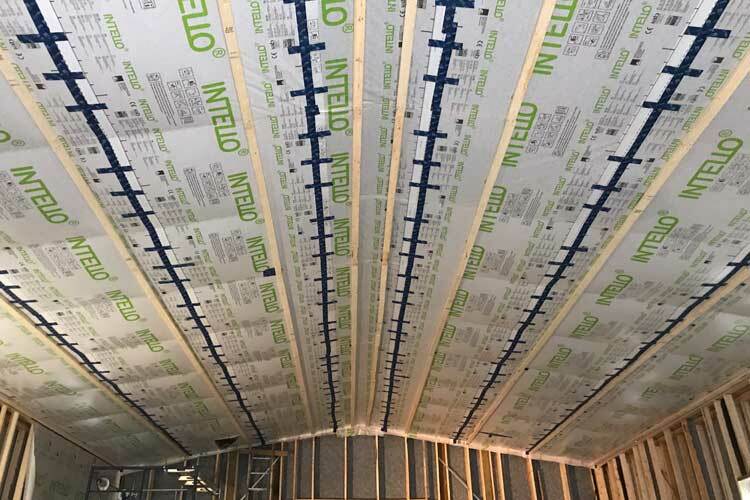 INTELLO PLUS, laid out in long strips, straight and wrinkle-free, with TESCON VANA stitch-taped at unsupported seams, forms the continuous inboard airtight layer and smart vapour control. In the design phase, 475 was happy to provide a WUFI pro analysis demonstrating the low risk result of this build-up. 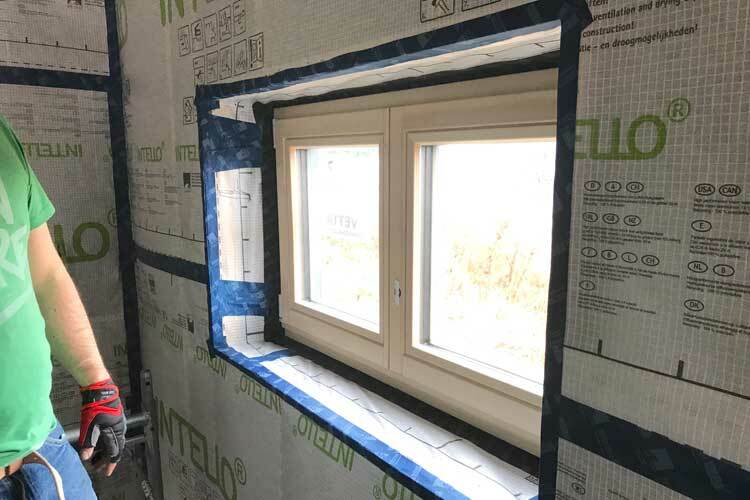 Window and door openings received the Pro Clima high-performance treatment: EXTOSEAL ENCORS sill flashing tape and CONTEGA SOLIDO EXO pre-applied around the frames. Without it, you have nothing! Keeping the material clean and saving off-cuts of Solitex Mento to create cells in double stud wall later to ensure consistent dense pack density. This was also a great way to keep the studs from bowing under pressure from dense packing. 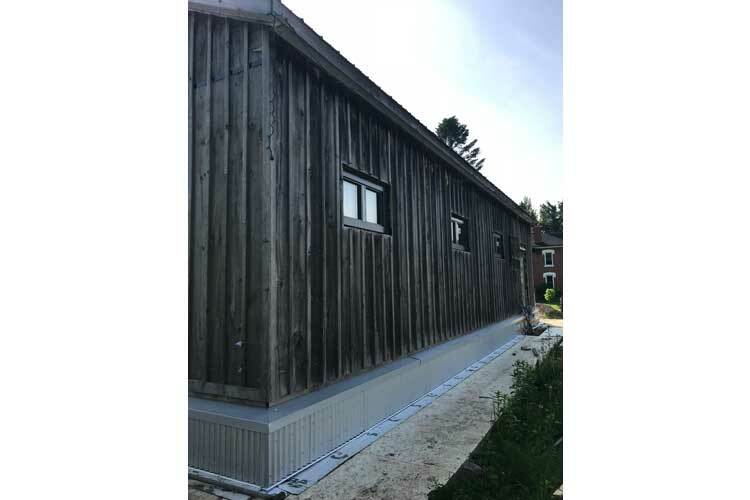 Addressing a tricky connection to the wall Mento around the top of posts, which due to the lack of top plates or sheathing to contain the cellulose, was only possible with CONTEGA HF and TESCON PROFIL. 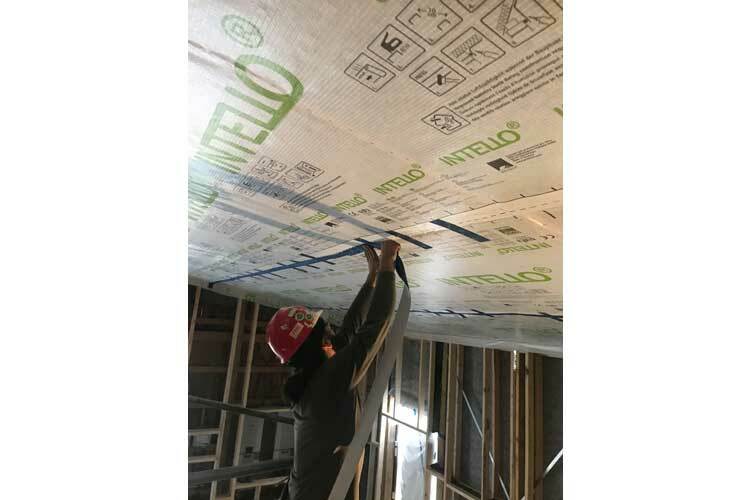 Stapling, taping, and strapping the INTELLO in the ceiling all at the same time, as well as using one person working high and one low allowed for maximum efficiency. Keeping the membrane taught made stapling overhead easy, while “stitch taping” was used where seams were unsupported. 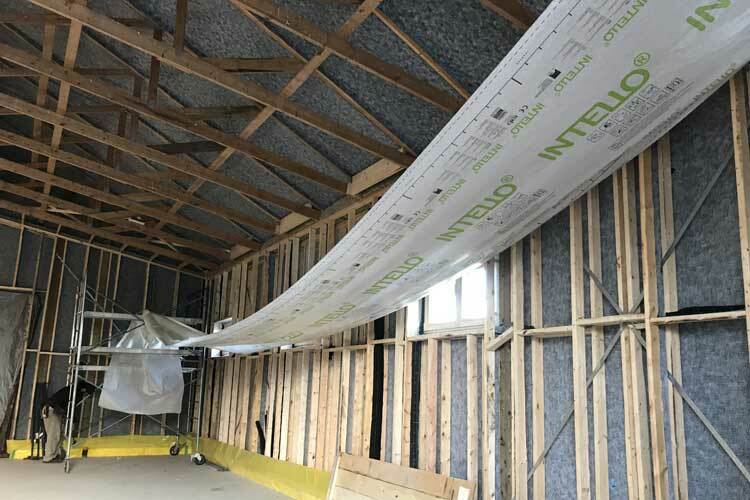 Controlling penetrations using “sleeves” before and after the cellulose install, which allowed for maintenance of airtightness without relying on trades. 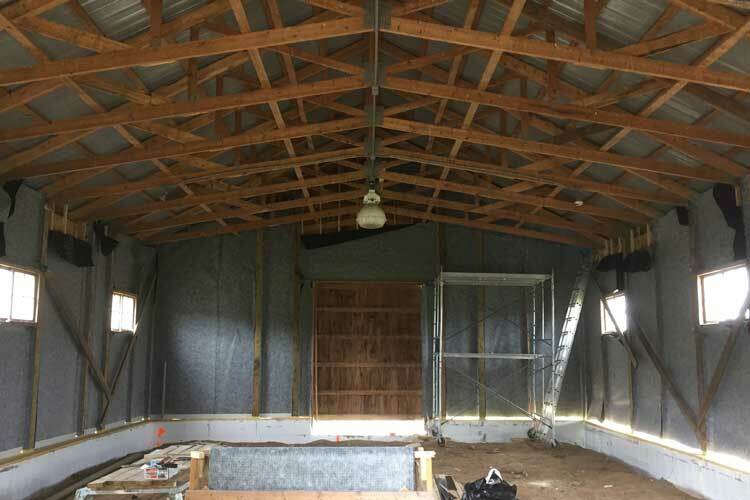 The trades appreciated that all work was coordinated with them, and airtightness accountability kept in the Fourth Pig’s hands. All penetrations taped with TESCON VANA, showing its versatility. It’s this attention to detail and reflection leading to improvement that makes builders like the Fourth Pig really stand out. The photos speak for themselves. Not only does this project combine two things we love here at 475, beer and building science, it packs a double punch for advanced high performance building. The Fourth Pig has successfully built a durable building that fulfills the needs of the occupants and the planet through smart material choices and smart building design. From their perspective, it wouldn’t have happened without a focus on importance of integrated design and collaboration between the brewery, the Fourth Pig, architects ERA, engineers Revive and ZON, and the team at 475. We hope to see more buildings built this way, and more professionals in our industry approaching their projects with the goal of cutting embodied as well as operational carbon emissions. Congratulations to the Fourth Pig on such an outstanding project, and congratulations to Goodlot on your new brewery. Cheers!